Adam Dugdale. Picture: Matt Rushton. Adam Dugdale has joined National League Eastleigh after being released by Morecambe. The 28-year-old central defender has signed a two-year deal with the ambitious Hampshire club after one season with The Shrimps. 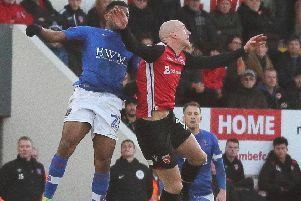 Dugdale, whose former clubs include Crewe and Tranmere, had a frustrating, injury-hit campaign at the Globe Arena as Jim Bentley’s side shipped 91 goals in League 2. Eastleigh manager Chris Todd said: “I’m really pleased to bring Adam in, he is an experienced, imposing centre-half. “He’s showed great ambition to join the club and he wants to help guide us to success. The Spitfires finished seventh in the National League last season.